Director/Screenplay – Kurt Wimmer, Producers – Jan de Bont & Lucas Foster, Photography – Dion Beebe, Music – Klaus Badelt, Visual Effects Supervisor – Tim McGovern, Visual Effects – Pacific Title and Digital (Supervisor – Ronulo Adriano Jr), Post Logic Studios & R!ot (Supervisor – David Sosalla), Digital Cityscapes – Digital Firepower, Inc., Special Effects Supervisor – Uli Netzer, Production Design – Wolf Kroeger. Production Company – Blue Tulip. In the 21st Century, with the establishment of the state of Libria, all feeling has been eliminated and the populace is kept narcotised with the drug Prozium, which suppresses emotion. An ultra-elite police force The Tetragrammaton Clerics have been established. Schooled in incredible martial gun techniques, it is the job of the Clerics to eliminate books, works of art and sentimental relics of the past that are hoarded by members of the underground, which consists of people that have stopped taking their drugs. John Preston is a top Cleric. Preston becomes troubled after he is forced to eliminate his partner for taking home and reading a book of poetry. After Preston accidentally smashes one of his capsules of drugs, he begins to experience emotions for the first time. He discovers feelings for Mary O’Brien, one of the Sense Criminals he has arrested. He then contacts the rebel underground who urge him to take the ultimate step of eliminating Libria’s leader Father and bringing the society down. Equilibrium is a German-made science-fiction film that arrived with a modest degree of acclaim. It was the second directorial effort for Kurt Wimmer, previously a screenwriter for films such as Sphere (1988) and The Thomas Crown Affair (1999). Equilibrium proved a considerable hit in European release, although was barely seen in the US but has since gained a minor cult reputation. 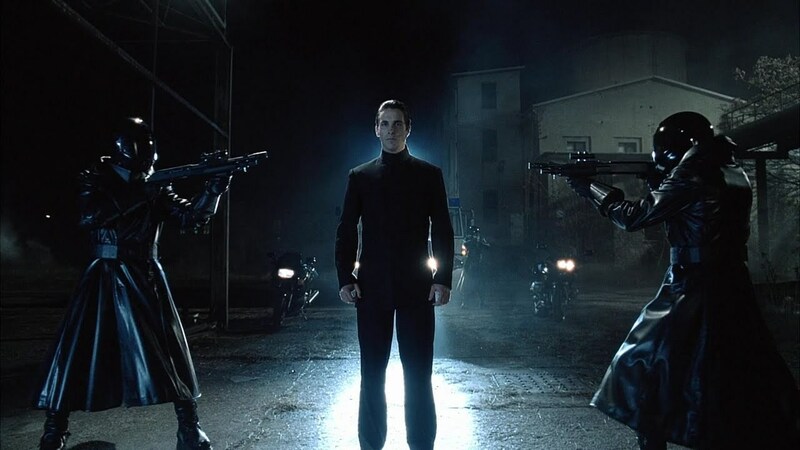 Seeing Equilibrium eventually on video, one finds it to be a colossal disappointment. For all that Equilibrium was acclaimed an intelligent science-fiction film, it seems to no more than a collection of clichés from just about every Dystopian science-fiction film and book ever made:– the drugged populace and the suppression of emotions as seen in THX 1138 (1971); the elite police force charged with destroying books from Ray Bradbury’s Fahrenheit 451 (1953); the policeman hero who becomes tempted by the rebels he suppresses as in Fahrenheit 451 and Logan’s Run (1976); the paternalistic face of the society’s leader and the forbidden love affair from George Orwell’s Nineteen Eight-Four (1949). The film even borrows the Voigt-Kampf empathy test from Blade Runner (1982) at one point. Everything in Equilibrium feels like a Dystopian cliché. The scenes of Christian Bale’s opening to the forbidden way of life are sentimental clichés – crushing his drugs underfoot in the midst of a rally, tearing the covering on his window open so that he can see daylight and rain, one of his victims dying in his arms, finding a snowglobe. The worst of these is the scene where Christian Bale suddenly starts to get sentimental over a puppy. This would not be so bad in itself but for the fact that while Bale expresses sentimentalism for a puppy, seconds later he goes into action and slaughters a whole unit of armed troops without even a second thought. The double double-cross that occurs at the end is also ridiculously contrived. Even more bizarre is Equilibrium‘s attempts to graft this by-the-numbers Dystopian story onto modern martial arts stylistics a la The Matrix (1999). Christian Bale and the Clerics are given an unexplained ability to shoot handguns at high-speed and supposedly move in mathematical ways that allow them to find the least likely paths of an opponent’s bullets (a concept that Kurt Wimmer calls Gun Kata and has used in other films). This is ridiculous and improbable as it sounds and seems like nothing more than an awkward attempt to graft contemporary stylistics onto a story where they do not belong. Kurt Wimmer next returned to matters dystopian and stylised action moves in Ultraviolet (2006), which is altogether a more interesting and original film. Wimmer has also written the scripts for films like Double Trouble (1992), The Neighbor (1993), Relative Fear (1994), Sphere (1998), The Thomas Crown Affair (1999), The Recruit (2003), Street Kings (2008), Law Abiding Citizen (2009), Salt (2010) and the remakes of Total Recall (2012) and Point Break (2015).